"Now! Now!" cried the Queen. "Faster! Faster!" And they went so fast that at last they seemed to skim through the air, hardly touching the ground with their feet, till suddenly, just as Alice was getting quite exhausted, they stopped, and she found herself sitting on the ground, breathless and giddy. The Queen propped her against a tree, and said kindly, "You may rest a little now." Alice looked round her in great surprise. "Why, I do believe we've been under this tree all the time! Everything's just as it was!" "Of course it is," said the Queen: "what would you have it?" In January, I bought an iPhone. It wasn't a decision I was necessarily proud of, but I haven't regretted it yet. My old cellphone was held together with duct tape and chewing gum, woefully out of date, and when I decided to upgrade I figured I should treat myself to the best. This week, I discovered that there's a Kindle app for the iPhone. For the most part, I've been anti e-reader. They strike me as unnecessary, expensive, and constrictive in terms of what you can and cannot do (take handwritten notes, or lend to a friend, for example). But the new application I've downloaded to my iPhone offers me most of the Kindle's primary perks for free. I don't get that nifty "E Ink" or the large screen, but I do get the opportunity to purchase digital books at lower prices than print copies - book that I can read pretty much anywhere I go. I haven't bought any Kindle titles yet. I don't know if I will - I'm still extremely reluctant to take that final step, and my iPhone's small screen and limited battery life means that it's not a perfect e-reading device by any means. But I downloaded a few of the free books that were offered - Jules Verne's Journey to the Center of the Earth was the first one I found. Browsing through, I wasn't as appalled as I thought I would be. The text is clear and easy to read, the navigation system is fairly self-explanatory, and there's even a tool for taking notes on the text. But I couldn't help but ask myself what the point was. To be able to pull up the entirety of the Great Books of the Western World on a device the size of a credit card is a nifty party trick, but what are the practical applications? Do people really sit around reading novels on these devices? When the iPod debuted, it was revolutionary in its ability to carry your entire music collection around in your pocket. But whereas I have fond memories of my friends in the 90s lugging around large binders full of CDs, the need to carry around a large number of texts is far less pressing. Even when I go backpacking, where space is tight and weight is a factor, it's never a big deal for me to throw a paperback on top of everything else. E-readers are attempting to fill in a niche that doesn't exist, at least for me, which I think explains some of the ambivalence people have toward these devices. Still, it seems very likely that such e-readers are going to be the future of literature and journalism (the other alternative being that these industries don't have a future at all). But will anything have fundamentally changed? In a decade, we might have the ability to stream any book we want to our e-reader, but will this cause any sort of shift in our reading habits? Maybe I'm being cynical, but I don't see any sort of literary paradigm coming out of this. Libraries (and more recently, Amazon.com) have long allowed us to get our hands on any book we desire relatively easily. By 2030, we might all be reading these books on fancy devices with E-Text, but I don't think we'll be reading any differently. There will be some growing pains within the industry, but, for the average American, I doubt that the change in medium will have any sort of great effect. 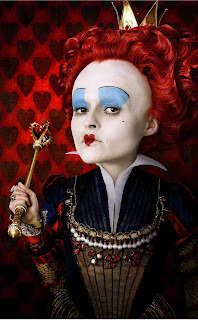 Biologists have a term for this sort of pseudo-progress - they call it the Red Queen Hypothesis. Put simply, the idea is that creatures are constantly evolving in order to maintain the status quo. Predators evolve to get better at eating things, and their prey evolves to get better at avoiding being eaten, but the food chain remains relatively static. I feel the same way about a lot of so-called advances that are happening at the beginning of this decade. Ten years ago saw the unprecedented growth of the Internet, and the rise of the mp3 and the DVD, which all changed our society a great deal and drastically affected how we interact with each other and consume art. But now all the techies are out there pulling for new developments that are not nearly as exciting or groundbreaking. Take the recent appearance of Blu-Ray on the market. Walk into the electronics section of any store, and Blu-Ray is thrust in your face as the Format Of The Future. You just got a bunch of DVDs ten years ago? That's nice, but look at how much better quality these Blu-Rays get you! Just be sure that you get yourself a high-resolution plasma screen TV, and possibly some surround sound speakers to go with it. I've seen the arguments for the merits of Blu-Ray, and on paper they make sense. But, like the Kindle, this new format strikes me as zero-sum game, in which the small benefits of Blu-Ray are balanced by the expensive initial cost and the fact that it doesn't necessarily change your fundamental viewing experience (as opposed to, say, DVDs vs. VHS). If you sit at home watching TV all day in your Fortress of Solitude, and/or you really care about the visual quality of what you watch, I suppose Blu-Ray is a good investment, but for the average American I can't see the format catching on. It's the same thing, slightly flashier, slightly better looking, but not promising any big changes. The bar is set slightly higher, but essentially we're running in place again, moving forward at breakneck speed just to stay where we are. Likewise, in the theaters, we have three-dimensional movies. In the Age of Avatar, we're promised a lifelike experience as we don our 3-D glasses to be transported to a multi-dimensional world of wonder and excitement. It's true that Avatar looked mighty fine; I might even hazard that I've never seen anything like it before. But a multitude of three-dimensional films are following in its wake: in addition to the current Alice in Wonderland, Clash of the Titans and How to Train Your Dragon are just around the corner, with surely more in the future. These movies look different, and might even be a fundamentally different experience. But are they better? I don't think so. It's intriguing as a novelty, but I can't say that this form of filmmaking - high-budget CGI combined with cinematography techniques I can't even begin to understand - is superior to past kinds of filmmaking in anything more than the purely technical sense. The intoxication of the new is the belief that whatever is new and exciting is therefore better, but I don't think that's the case. Movies have gotten more technically impressive in the past twenty years, but I can't say that I enjoy Avatar any more than 1993's Jurassic Park. Hollywood is running as fast as it can to make a different kind of product, but at the same time I don't think that movies are any better or any worse than they've ever been. They're just sort of the same, quality-wise. I suppose I shouldn't really be complaining about this. Any culture goes through this self-renewal, and surely it's preferable to artistic and technological stagnation. To avoid being stuck in a rut, we do need to the new to come and replace the old - new artistic movements, new devices, new ways of looking at things. But it's a mistake to believe that the new is a step above what came before. It's different, but not necessarily better. It's always exciting to believe that an Edenic Golden Age is just around the corner, but to believe in this sort of redemption through progress is a teleological falsehood. Things will change - that's a given - but I think it's important to ask ourselves whether or not things are getting better. I'm not saying change is bad, and I'm not saying that I don't enjoy my iPhone. But I do think that we need to be careful not to mistake the new for the higher quality. Appreciate the difference, but don't kid yourself that it's heads above everything that came before. And so the race to the future continues, but for some reason the scenery still looks awfully familiar.